Things have been crazy for me. The PlayStation port has been more complicated than I planned, and I actually started a new job (ie not at Infinitap). I can't say anything about what I'm working on, but I am really enjoying it and I am learning a lot. I am loving my job although I am a little sad to report that it has nothing to do with horror. After the failure of Devastated Dreams, I felt pretty burned out. I was working on some other stuff (besides the port) that I was excited about, but I wasn't excited enough about it that I would be willing to do all the PR and everything necessary to bring an indie title to market. It felt weird to me because I came to the realization that so much of indie development was about marketing, which I don't really like doing. I was hoping to just focus on making games. We did that with Retro/Grade, and then no one even realized the game came out. :-/ I was looking for potential partners on the marketing/publishing side, but even that was work I didn't want to do. I feel like this is sounding like a sad post, but it is meant to be a happy one! I love my new job, I love being dad, and I honestly am loving the change of pace. I always have the option of returning to indie dev, but I really needed a break. I am working with Dan on bringing Neverending Nightmares to more platforms, and I may dabble with another project on the side, but I am really thrilled with my day job. Even if every project I work on moving forward gets cancelled, I feel fortunate that I was able to say something important and personal with Neverending Nightmares to a wide audience. That isn't something every artist gets to say, so I feel blessed. I want to thank you again for all your support, and I am happy to keep the forum open if you guys are still interested. I will try to check it more often. It has just been a crazy busy time for me being a dad and transitioning to the new job without being totally finished with the PlayStation port. Good to hear things are going well, Matt! The indie scene looks like a tough way to go, I mean on one hand there are so many avenues now, but on the other hand, there are a lot of things competing for people's attention. That's my armchair analysis anyway, I know although I love to find interesting new games, so many are coming at you lately that it's difficult to even keep up. On Steam alone, I don't even notice 50% of the new releases anymore. Are you working in the game dev industry still, can you say? I've not been stopping by much lately, I'm settling into a new-ish job still myself, and doing a lot of studying for some certification exams in hopes of getting ahead in said career path (I'm easing into the tech industry after a long detour away from it). Still, it is good to know the forum is still around, even if pretty inactive lately. I am actually working at Google on the Cardboard team, but I can't really say what I'm working on beyond that. All I can say is that I'm really excited about the work I'm doing, and it is a super fun project to work on! Isn't the tech industry tough? It moves so fast that it's really hard to stay on top of everything. I am certainly learning a lot working at Google. Oh wow that is awesome, congratulations! Google must be an incredible place to work for, I can only imagine what creative and technical things you're getting into over there. Tech is definitely a challenge. I'm really just a help desk monkey right now, so I have a long way to go, but there's always something to keep up with. Congratulations on getting a job at Google. I've been waiting to see the reviews for Google Daydream before investing in any new mobile VR headset. For now I have an inexpensive Leji VR Mini headset I've been using for viewing 360° videos and photos. My brother has a BoBoVR Z4. That model is the current king of the cheap Chinese plastic headsets according to many redditors and review sites. 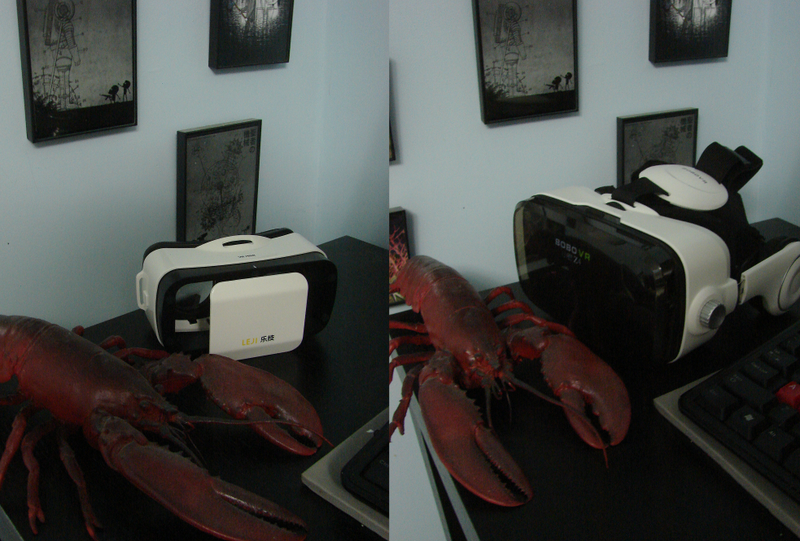 The much wider field of view is very noticeable for improving the immersion.